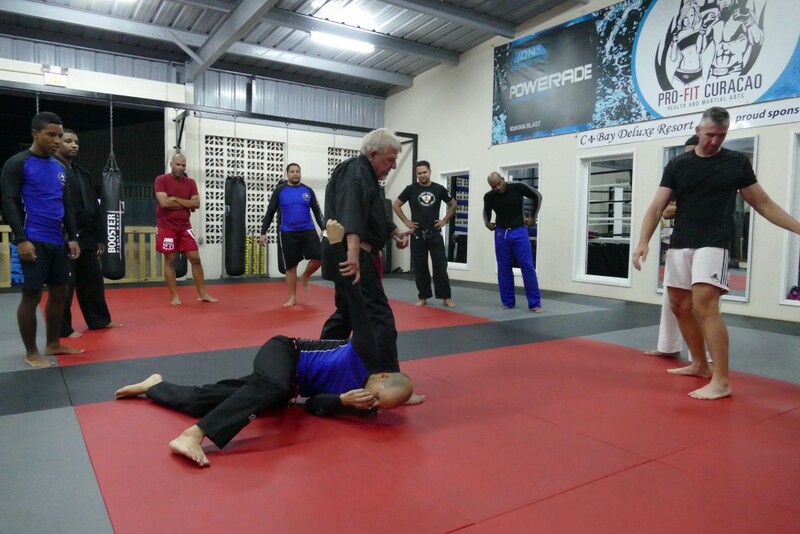 WILLEMSTAD - On August 19, Medina Grappling Association and PRO-FIT Curaçao successfully organized a Jiu Jitsu & Self-defense course by Master Krupa who is a multiple black belt degree holder in Jiu Jitsu, Kempo Karate & Judo. The seminar was visited by several martial arts practitioners with different types of backgrounds among others summer Olympic of 2012 Judoka Reginald de Windt. The practitioners learned fine self-defense techniques based on traditional Jiu Jitsu and Master Krupa experience as a police officer in Canada. Master Krupa who is 68 years of age surprised all practitioners with his skills, great condition, and his great jokes. Medina Grappling and PRO-FIT Curaçao were very happy with the result and they said that Curaçao can expect more of these seminars in the near future. "We were honored to welcome such high degree holder, as we don't have that here on the island." They hope to welcome more multiple black belt degree holder in combination with a seminar.